Turquoise Hill Resources (NYSE:TRQ TSE:TRQ) fell 6% in afternoon trade on Monday after the company said it received a letter from Mongolia's mines minister asking to renegotiate a deal signed in October 2009 that gave the country 34% ownership of the massive Oyu Tolgoi mine. Kay Priestly, CEO of Turquoise Hill (formerly Ivanhoe Mines) which is majority owned by Rio Tinto rejected the request saying the Vancouver-based company has invested nearly $6 billion in the project in the south of the country, created thousands of jobs and is "on the verge of production based on the Investment Agreement, which provides a stable legal framework and is a legally-binding document." This agreement – which was "re-affirmed" by the Mongolian government a year ago when politicians also floated the idea of taking majority control of the project – "has been fundamental in building Mongolia’s reputation as an increasingly reliable and secure destination for foreign investment,” said Priestly. Following elections a month ago a group of influential Mongolian parliamentary backbenchers in a petition also called for the enforcement of a parliamentary resolution that gives the Mongolian government majority ownership of Oyu Tolgoi. Turquoise Hill's stock losses over the past month now stands at 15% as political concerns and worries about a electricity deal between Mongolia and China for Oyu Tolgoi – one of the richest copper and gold mines in the world – continue to mount. Turquoise Hill – a favourite of resource investors – is now valued at $8 billion and has been been on a wild ride since hitting an all time high above $28 in January last year affording it a peak market cap of $20 billion. Rio is in the process of putting together a finance package of an additional $3.5 billion – $4 billion on top of the $6 billion already spent to take Oyu Tolgoi to full production status, but a research report leaked earlier this year indicated final overall costs could come in at as much as $13 billion. The mine is set to produce more than 1.2 billion pounds of copper, 650,000 ounces of gold and 3 million ounces of silver each year. 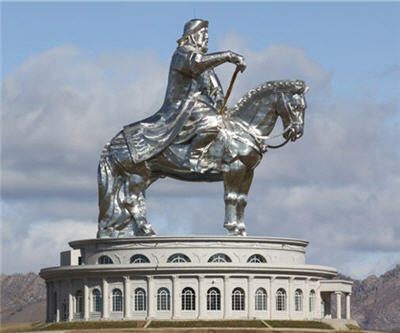 Image is the Genghis Khan statue outside the Mongolian capital which at 40 metres is the tallest in the world.